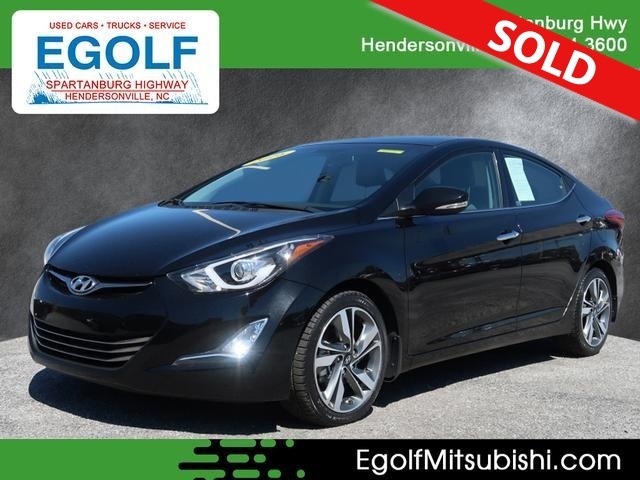 2016 HYUNDAI ELANTRA LIMITED, AUTOMATIC TRANSMISSION, ONE OWNER, CLEAN AUTOCHECK HISTORY, POWER EQUIPMENT GROUP, LOW MILES AND MUCH MORE. PLEASE CONTACT EGOLF MITSUBISHI SALES AND SERVICE @ 828-694-3600 FOR MORE INFORMATION AND TO SCHEDULE YOUR TEST DRIVE TODAY @ 1325 SPARTANBURG HIGHWAY, HENDERSONVILLE NC 28792. FINANCING AVAILABLE FOR ALL CREDIT TYPES!! Just because you're buying a compact sedan doesn't mean it has to be boring. The 2016 Hyundai Elantra is one of the most stylish small sedans on the market, and we like how its generous feature content gives it a strong value proposition. Find out more about the Elantra and what makes it appealing. The 2016 Elantra adds a well-equipped Value Edition trim level, with the base SE losing a bit of standard and optional content in the deal. In other news, the Limited trim gains standard keyless entry and ignition and automatic climate control, while the Sport sacrifices its standard leather seats. Generous features for the money; large trunk has plenty of room for your stuff; cabin is quiet on the highway; long warranty coverage. The 2016 Hyundai Elantra still looks fresh compared to other small sedans, and that's quite an achievement for the segment's elder statesman. But the fact remains that the current-generation Elantra debuted way back in 2011, and it exceeds all other major players for length of tenure. A savvy consumer might wonder whether the Elantra can continue to compete against its relatively youthful rivals or whether this head-turning Hyundai is finally past its sell-by date. Judged purely on its value proposition, the Elantra has hardly aged a day. Hyundai always seems to throw in more features than you'd expect, and that trend continues for 2016 with the attractively priced Value Edition. Stuffed with desirable add-ons like alloy wheels, a sunroof and keyless entry and ignition, this new trim level may make you question the point of the pricier Limited and Sport. But those trims come with even more accoutrements should you want them, and the Limited and Sport are priced lower than the premium versions of many competitors. If you're looking for signs of age, then, you won't find them on the equipment list. That means you'll have to get to know this Hyundai a little better. Driven back to back against its rivals, the Elantra impresses with its quiet cabin, but its suspension struggles to absorb major impacts so it doesn't ride as smoothly as some other small sedans. The popular 1.8-liter engine, meanwhile, can struggle a bit when climbing hills or dealing with a full roster of passengers. Opting for the Sport with its stronger 2.0-liter engine could be wise, but you'll lose some fuel efficiency in the process. Those may seem like minor quibbles, but if you sample the Mazda 3, for example, you're bound to notice its relatively zesty performance and refined ride, with no fuel economy compromise. Same goes for the Ford Focus, although, like the Hyundai, it's getting on in years. You've also got the affordable Kia Forte and the well-rounded Honda Civic to consider, while the Volkswagen Jetta offers diesel engine frugality in a slightly larger package. But the 2016 Hyundai Elantra can still hold its head high in this distinguished company, and that says a lot about its fundamental goodness. The 2016 Hyundai Elantra sedan comes in four trim levels: SE, Value Edition, Limited and Sport. Standard SE features include 15-inch steel wheels, full power accessories, intermittent wipers, air-conditioning, cruise control, a trip computer, a tilt-and-telescoping steering wheel, a height-adjustable driver seat, 60/40-split folding rear seatbacks and a six-speaker sound system with a CD player, satellite radio and a USB port. A Popular Equipment package is optional on SE, though only if you spring for the automatic transmission. It adds 16-inch alloy wheels, automatic headlights, foglights, heated mirrors, a driver blind-spot mirror, extendable sun visors with illuminated vanity mirrors, steering-wheel-mounted audio controls, a sliding center armrest, Bluetooth phone and audio connectivity, voice controls, a 4.3-inch touchscreen display and a rearview camera. The Value Edition starts with all of those items and adds a sunroof, keyless entry and ignition, heated front seats and a leather-wrapped steering wheel and shift knob. The Limited loses the sunroof, but it adds 17-inch wheels, projector headlights with LED accents, LED taillights, adjustable steering effort, a six-way power driver seat (with power lumbar), leather upholstery, dual-zone automatic climate control, heated rear seats and Blue Link telematics. Optional on Limited is the Ultimate package, which adds the sunroof back and throws in a 7-inch touchscreen display, a navigation system and an upgraded audio system. Finally, the Sport does without leather upholstery, automatic climate control, heated rear seats and Blue Link but otherwise includes most of the Limited's standard equipment, substituting black exterior accents, a sport-tuned suspension and steering system and a more powerful engine (with an available manual transmission). The Sport's optional Tech package (automatic transmission required) is similar to the Limited's Ultimate package, also adding Blue Link. The 2016 Hyundai Elantra SE, Value Edition and Limited are powered by a 1.8-liter four-cylinder engine that produces 145 horsepower and 130 pound-feet of torque. A six-speed manual transmission is standard on the SE, while a six-speed automatic is optional there and standard on the Value Edition and Limited. During Edmunds testing, an Elantra Value Edition sauntered to 60 mph in 9.5 seconds, which is notably slower than average for the segment. The EPA pegs fuel economy at 31 mpg combined (27 city/37 highway) for the manual-equipped SE and an identical 31 mpg combined for the automatic-equipped Limited. The other trims return 32 mpg combined (28/38) with the automatic transmission. These are solid numbers, though some rivals offer special, fuel-economy-themed models that are even more frugal. As for the Elantra Sport, it boasts a 2.0-liter four-cylinder engine that's good for 173 hp and 154 lb-ft of torque. The manual transmission is standard and the automatic is optional. At our test track, an Elantra Sport with the automatic zipped to 60 mph in 8.2 seconds, which puts it on the quicker side of the compact sedan spectrum. EPA fuel economy estimates for the Sport stand at 28 mpg combined (24 city/34 highway) with the manual and a similar 28 mpg combined (24 city/35 highway) with the automatic. Standard safety features for all 2016 Hyundai Elantra sedans include antilock disc brakes, hill-start assist, stability and traction control, front-seat side airbags and side curtain airbags. A rearview camera is optional on the SE and standard on the other trims. The Blue Link emergency telematics system (standard on Limited, optional on Sport) provides services such as remote access via smartphone app, emergency assistance, theft recovery and geo-fencing (allowing parents to set limits for teenage drivers). In Edmunds brake testing, a Hyundai Elantra Value Edition sedan came to a stop from 60 mph in 117 feet, which is a strong showing for a sedan in this class. Similarly, an Elantra Sport stopped in an admirable 118 feet. In government crash testing, the Elantra sedan received the top five-star rating overall, with four stars for total frontal crash protection and five stars for total side-impact protection. In Insurance Institute for Highway Safety testing, the Elantra earned a second-best "Acceptable" rating in the small-overlap frontal-offset crash test, but it garnered the top "Good" rating in the moderate-overlap frontal-offset, side-impact and roof-strength crash tests. Its seat and head restraint design was also rated "Good" for whiplash protection in rear impacts. The 2016 Hyundai Elantra's adventurous exterior design spills over to the cabin, where swooping lines and contours give the dashboard an avant-garde appearance. Most of the important controls are nonetheless easy to reach and figure out, while build quality seems generally solid. You'll find some hard plastic elements here and there, but they're convincingly grained to look more special than they feel. The available 7-inch touchscreen is quite user-friendly thanks to large virtual buttons and an intuitive menu layout. On the whole, the Elantra's interior is spacious, but taller drivers may have difficulty getting the seat as low as they'd like. As such, headroom up front can feel limited for those over 6 feet tall. The backseat is roomy and great for kids, though again, a lack of headroom might be an issue for taller adults. The Elantra sedan has a large 14.8-cubic-foot trunk, which is more capacity than most rivals, and the liftover height is low. The Elantra's standard 1.8-liter engine provides adequate performance in most situations, but it's definitely one of the weaker options in this class, and it also suffers from abrupt accelerator response. If you do find it lacking, the Sport trim level's larger 2.0-liter engine will likely be a worthwhile upgrade despite the fuel economy penalty. Either way, the automatic transmission is usually a smooth operator, but it can occasionally vacillate between gears. These shortcomings are partly why an Elantra Limited earned an Edmunds "B" rating overall. The Elantra's interior remains reasonably quiet at freeway speeds, which is a welcome luxury in this segment. Driven around turns, the Elantra feels stable and secure, though it's not particularly engaging, even with the Sport trim's firmer suspension. Our biggest gripe here regards the car's harsh ride quality over bigger bumps and potholes, making it feel unrefined compared with several key rivals.